Take your billiard cue and either challenge the computer in 5 different difficulties or play against a friend on the same phone. However you choose to play, 8 Ball Billiards features comprehensible ball physics and with it the ultimate satisfaction when potting a ball. There is no other sport where knowledge about angles and ball spin is as essential as it is in Billiards. And 8 Ball Billiards reproduces these important features of the game in a realistic way. 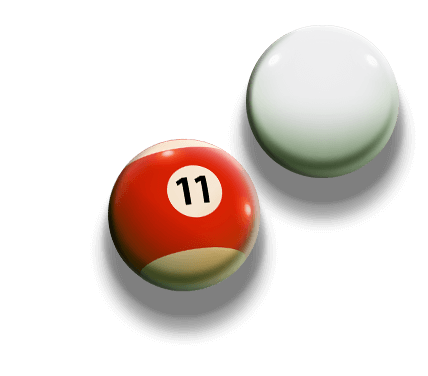 Depending on if you give the cue ball an undercut or where you hit one of the other balls, each of them will react physically accurate and move across the table accordingly. You play by the well-known and simple 8 Ball rules. You have to pocket all of your balls, either the striped balls or the solid-colored ones. If you have successfully removed all your balls from the pool table, it’s time to down the black eight ball in any pocket you want. But be aware that if you pocket the eight ball before you have removed all other balls, you will instantly lose the game. Take that into consideration when you try to hit the other balls. As a standard option reference lines are activated to show you where the ball you hit will go and how the cue ball will bounce off of it. But if you want the real eight ball pool experience you can disable this option in the menu and depend only on your skills and experience. Disable this function, play against a friend on the same device and you will have the closest experience to real Billiards that you can have on a mobile device. Only the background noise of a real bar or tavern we can’t provide. Everything else is as close as it gets. 8 Ball Billiards Classic - Find 8 Ball Billiards Classic in our vast HTML5 games catalogue. Only the best and newest HTML5 games for all audiences. Guaranteed success with Famobi.